This two story or duplex fully serviced three bedroom, two bathroom apartment is located within a stylish private apartment complex. 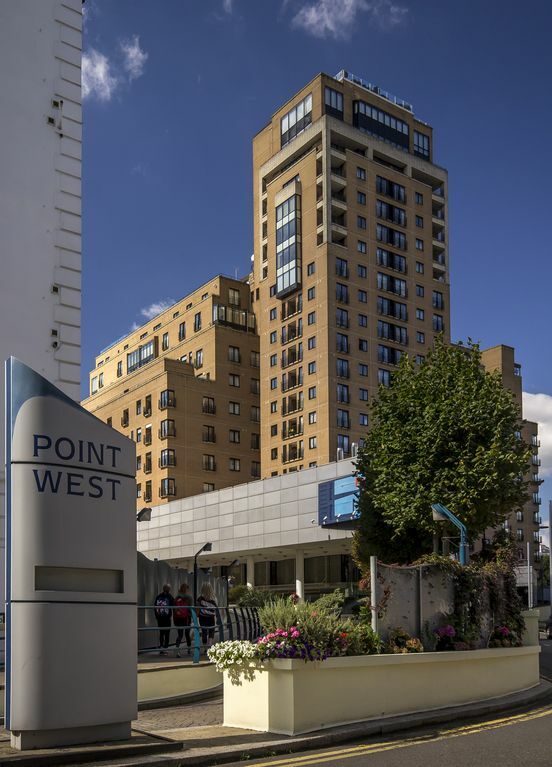 Point West offers residents and guests fantastic access to a range of shops, restaurants and bars in the heart of Kensington a short walk from both Kensington high street and Kensington Gardens. 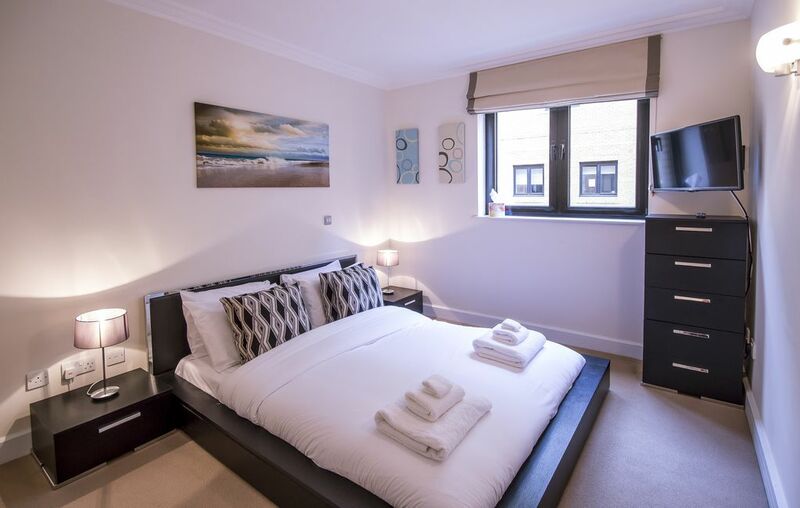 The apartment features three bedrooms, two bathrooms (one an en-suite) as well as a large living room, kitchen and balcony with views over West London. 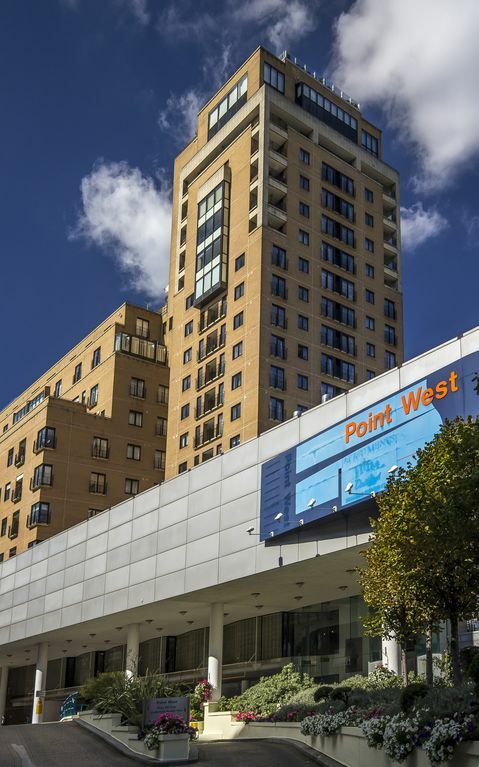 Point West is a private apartment complex with 24 hour reception. 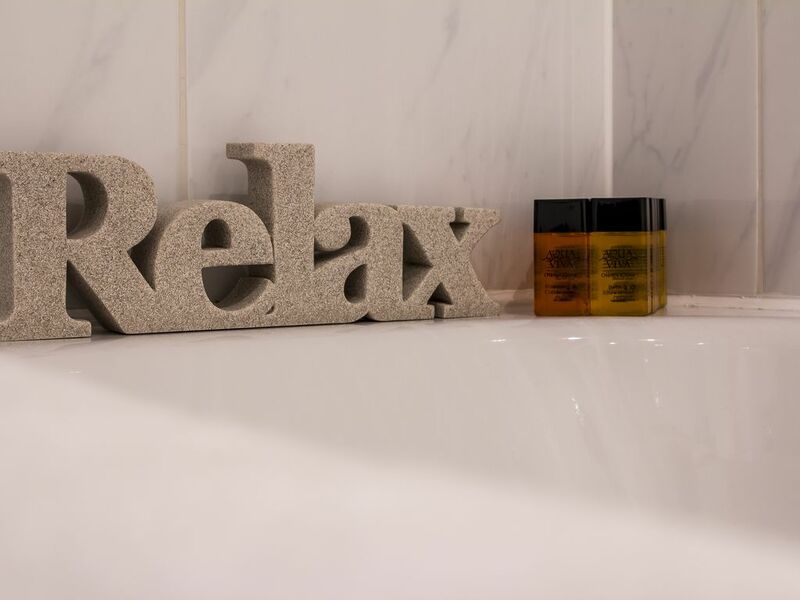 To help you unwind and relax Pure Sports Medicine, located in the complex, offer health, well-being and performance packages such as massage. 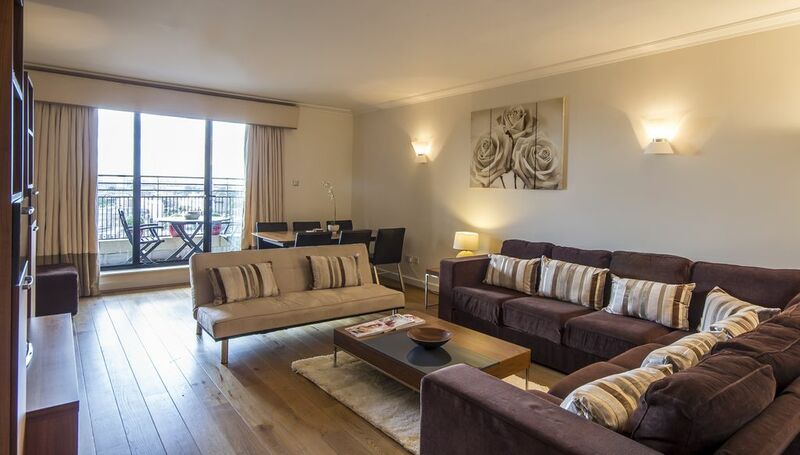 The duplex is arranged over the 8th and 9th floors and offers fantastic views of West London. Taking the buildings lift, the apartment is accessed from the 9th floor entering on the upper level of the apartment to a spacious landing. 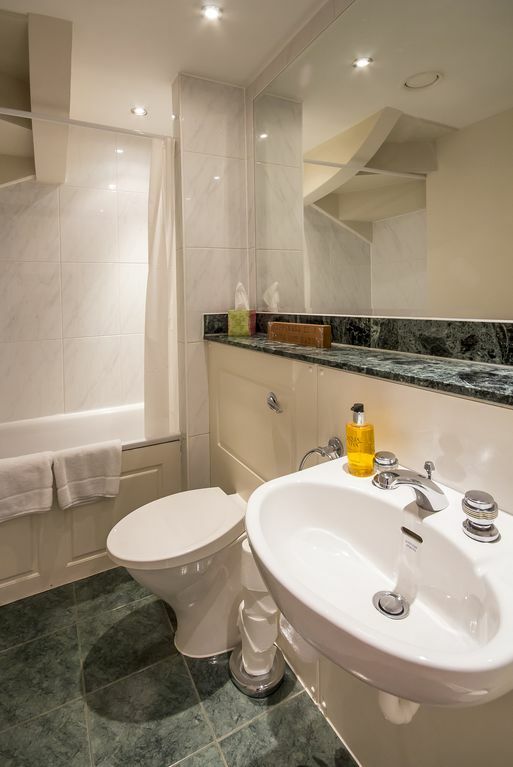 Upstairs, your tour begins with the master bedroom (sleeping two guests) which features an en-suite bathroom. 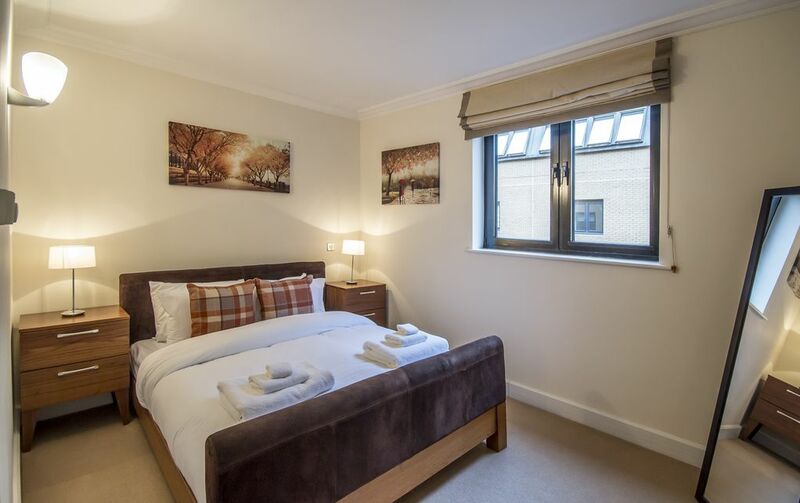 This is the largest of the three bedrooms with a king size bed, a large set of fitted wardrobes and cupboards and your own TV for late nights or relaxing mornings. 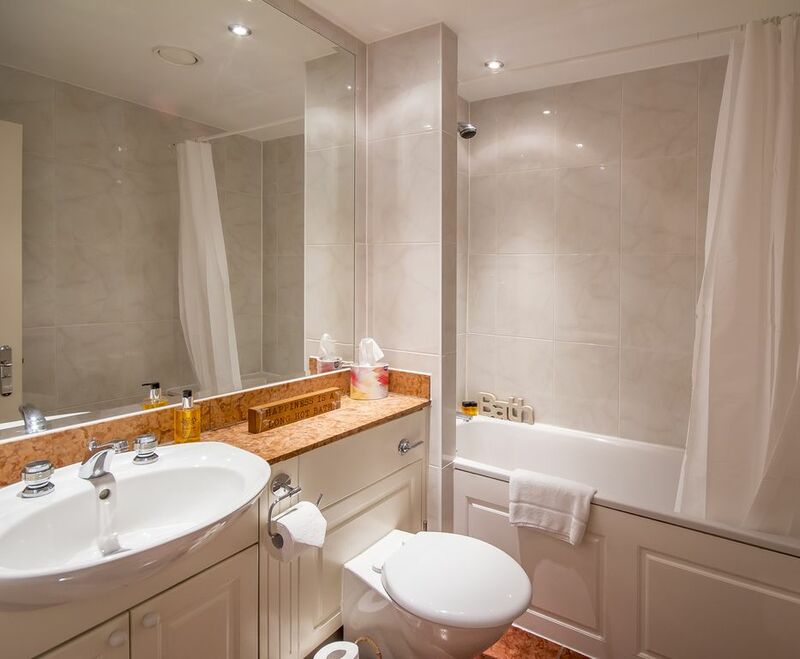 The en-suite bathroom is fully tiled and offer a shower over bath, sink and WC. 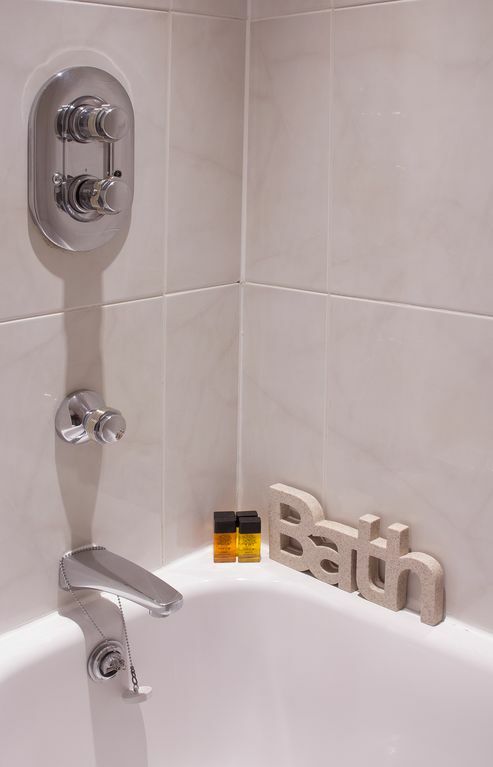 The en-suite also comes with bathroom essentials such as shower gel and hand-wash. Moving downstairs we come to the remaining bedrooms and the main living space. Turning left at the bottom of the stairs we come to the main, family bathroom. Again this is fully tiled and furnished to a high standard and has a bath over shower, sink and WC along with your bathroom essentials. 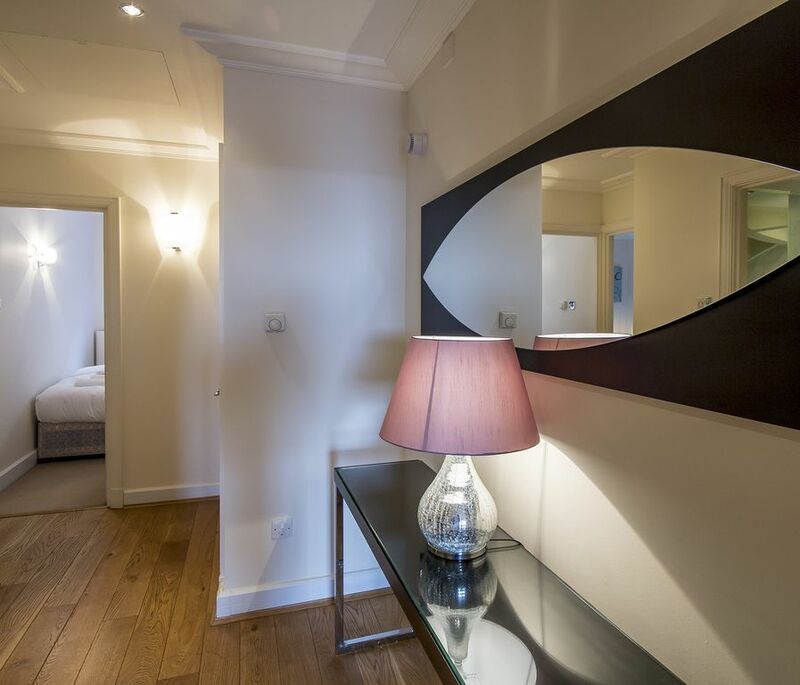 Next to this we come to the second double bedroom (sleeping two guests) with a low, modern king size bed. 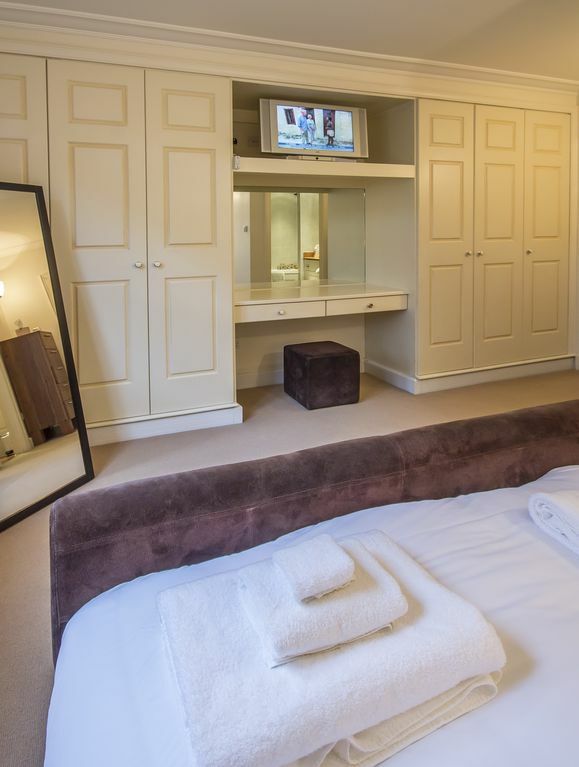 Again this room is decorated in a modern style and features fitted wardrobes and your own TV. 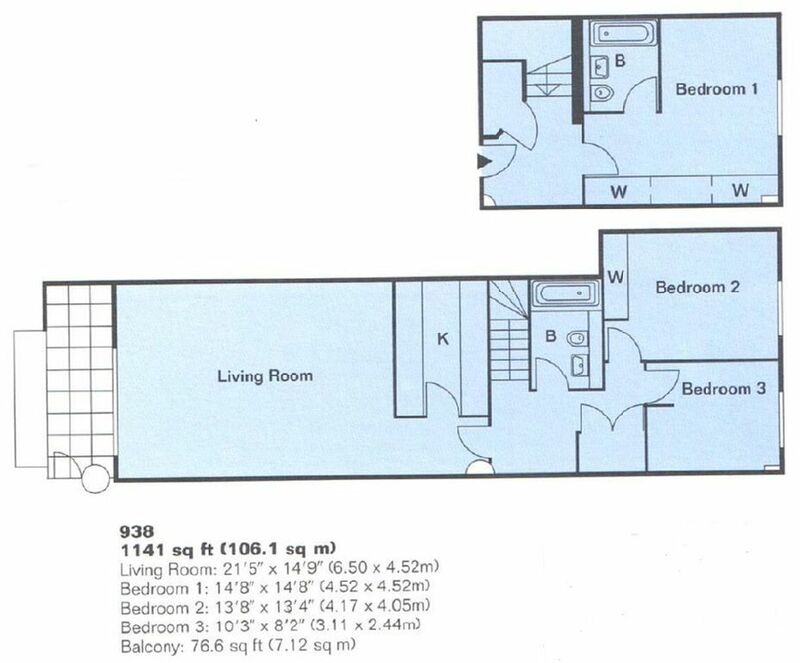 Adjacent to this is the final of the three bedrooms. 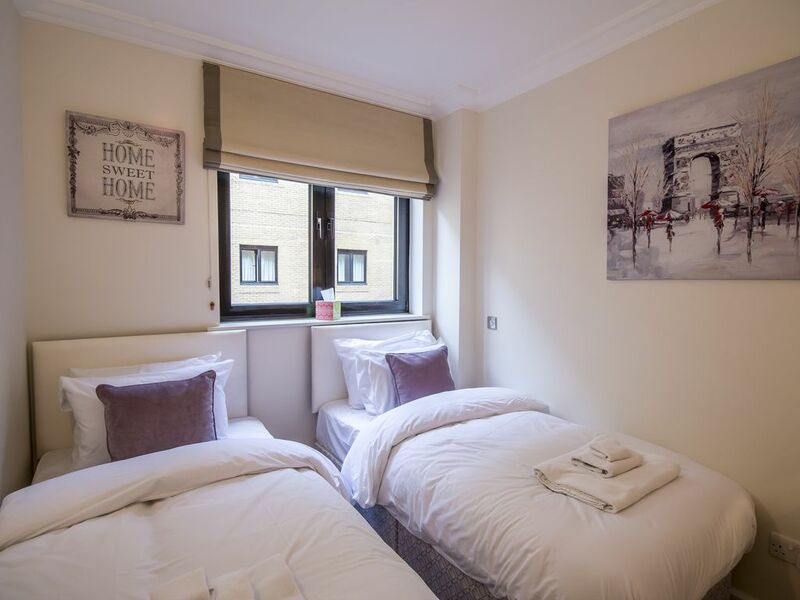 This is a twin room with two single beds (sleeping two guests). 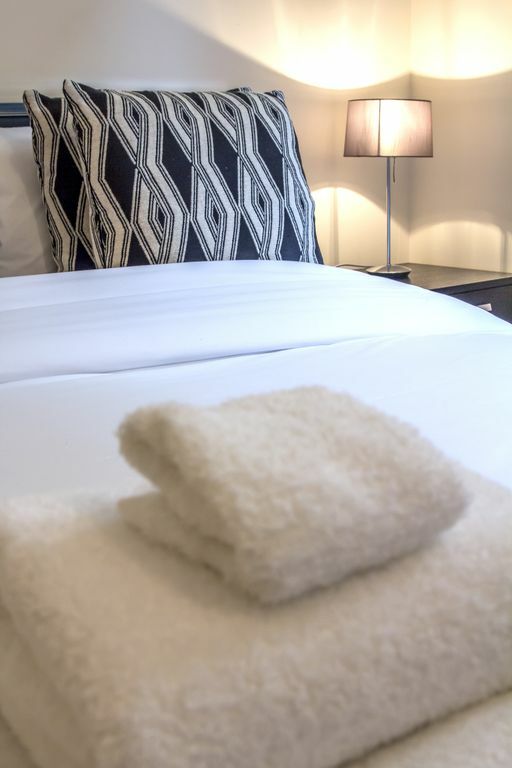 All three bedrooms are decorated to the highest standard with fabulously comfy beds, bedding and towels for your stay. Entering the main living space we first come to the separate kitchen. The galley kitchen has everything you need to prepare fantastic meals for your party. Check out the facilities information below for a full list of what you can find. 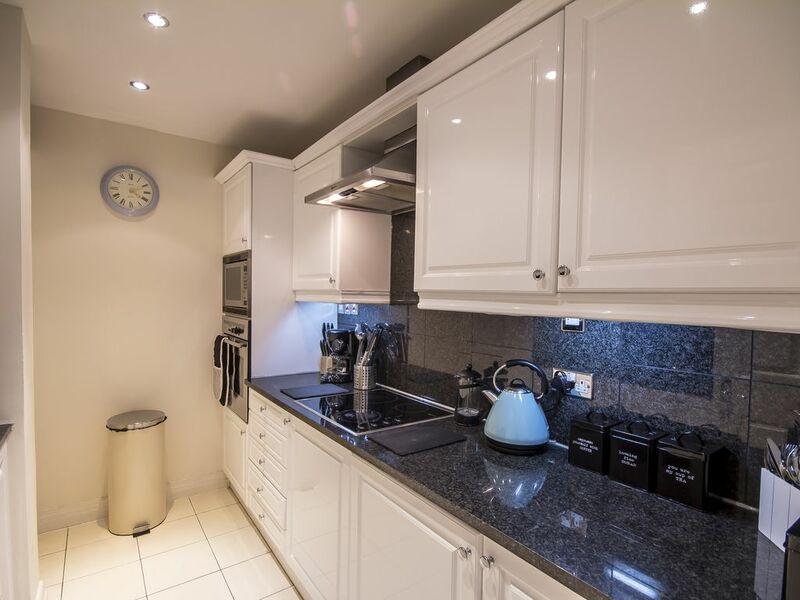 The kitchen features a NEFF induction hob, child safe and cool to the touch as well as oven and microwave. You will also find a filter coffee maker and large 4-slice toaster. Other appliances include a large fridge/ freezer, dishwasher and washing machine. 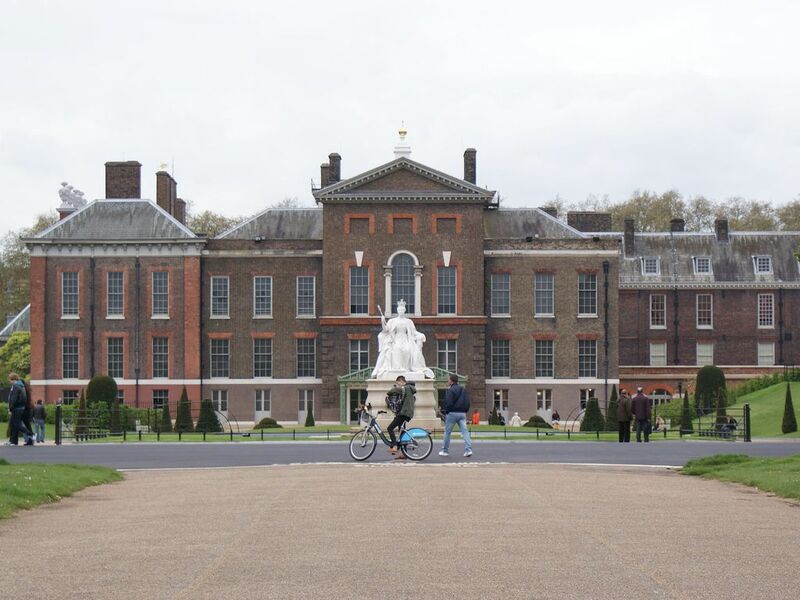 Next we come to the large and spacious, modern living and dining room. 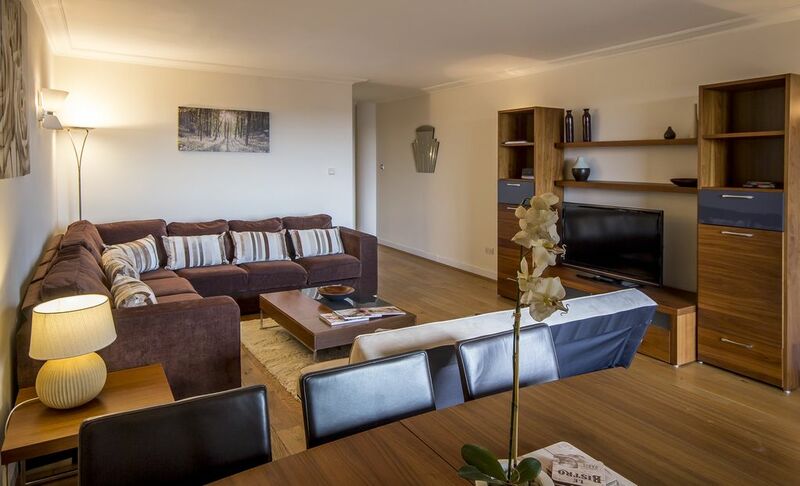 This is tastefully furnished with two sofas (one of which is a sofa bed sleeping 2 guests), cable TV, WiFi hub and the dining suite. 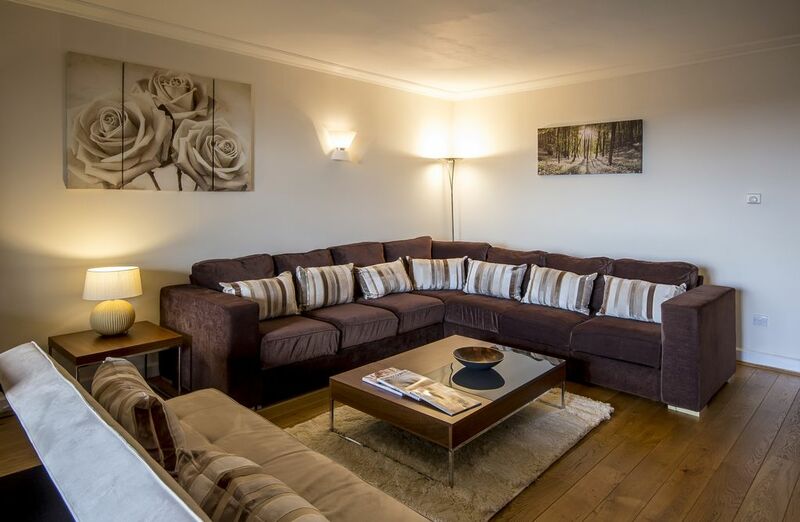 The relaxed space is perfect for family nights in, elegant evening dinners and lazy Sunday afternoons. Within the built in entertainment centre unit you will find two sets of over ear headphones. The living room is lit via the large patio-windows which open up on the the apartment’s balcony. 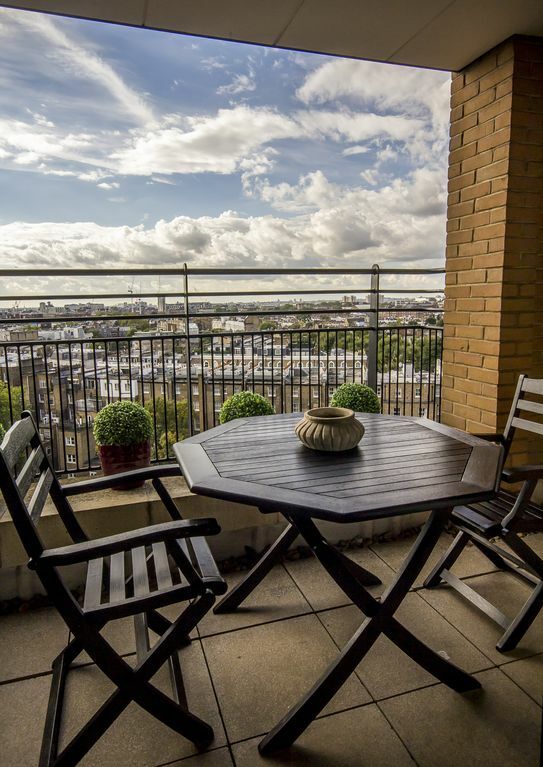 The balcony is just off the living room and from here you get fantastic views out over the West London skyline and cityscape. The balcony comes complete with table and chairs for alfresco dining in the summer. 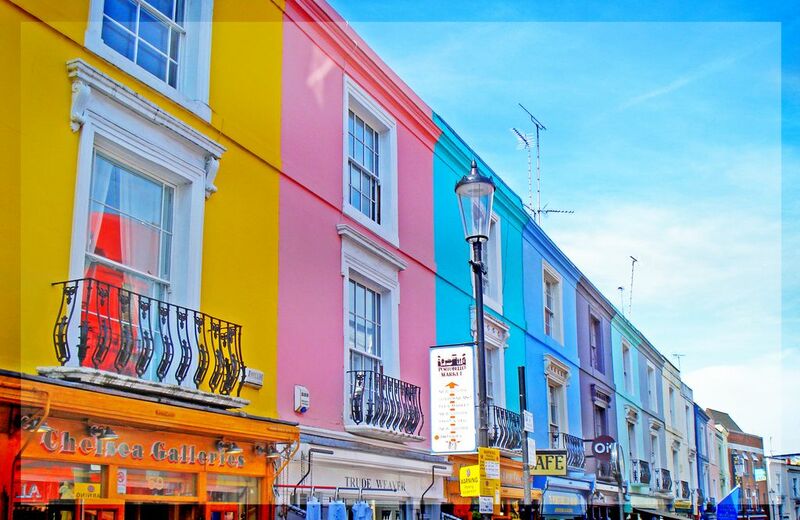 This family or group friendly holiday rental is located minutes from Gloucester Road underground station (five minutes walk) and a 17 minute walk from either Kensington Gardens, Palace and Kensington high street. 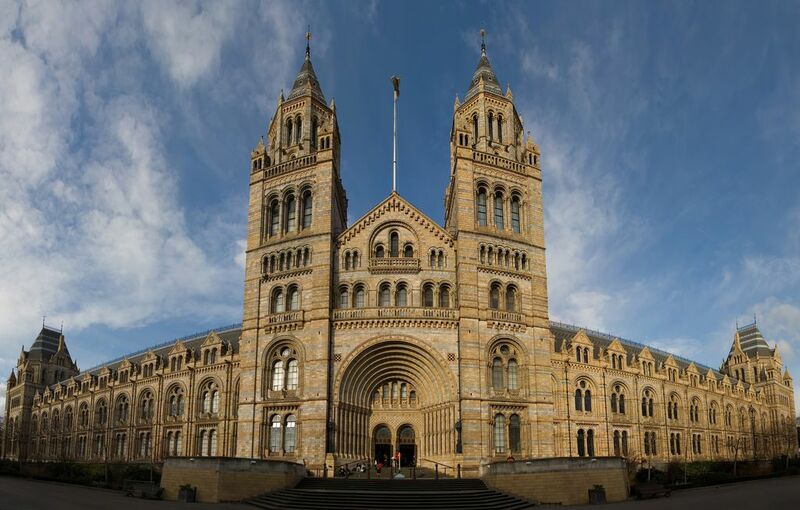 South Kensington, home to London’s best selection of museums, including the Natural History Museum, Science Museum and the Victoria & Albert (V&A) museum are all around a 10 minute walk from the apartment. 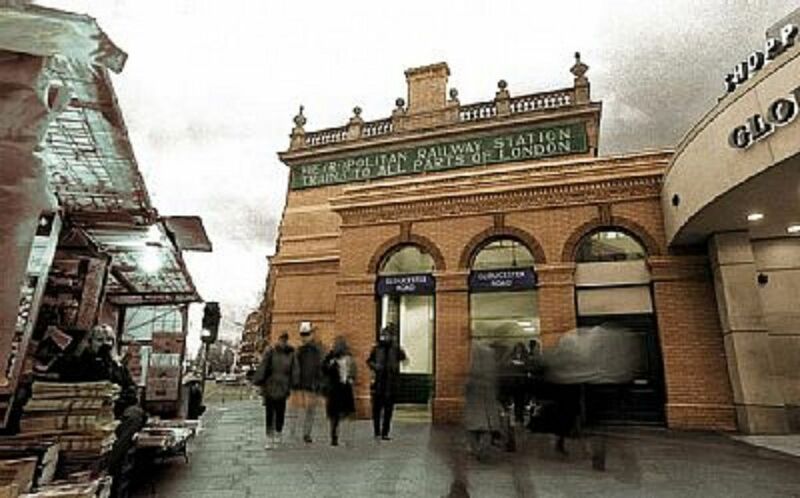 Gloucester Road Station is on the Piccadilly, Circle and District lines with easily accessible travel across the capital. 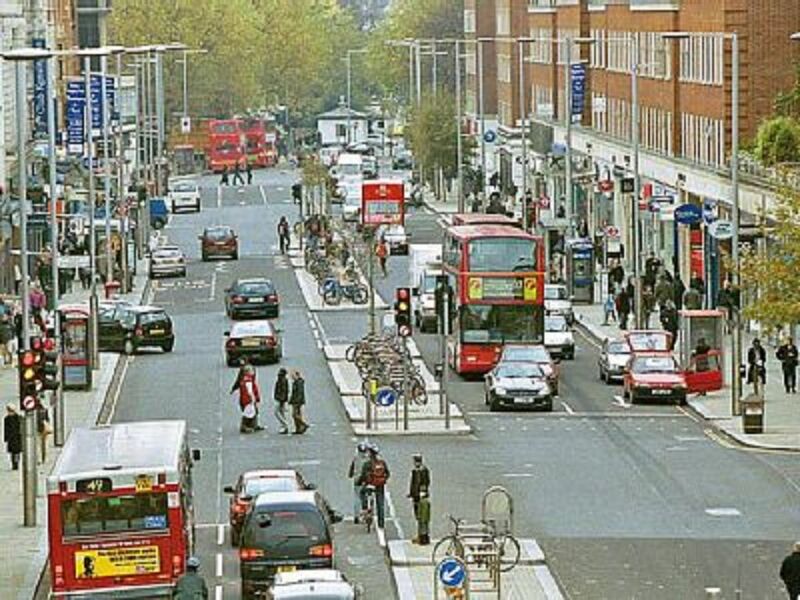 Heathrow airport is accessible in around 40 minutes via tube with the London Eurostar terminus at St Pancras station approximately 15 minutes away.